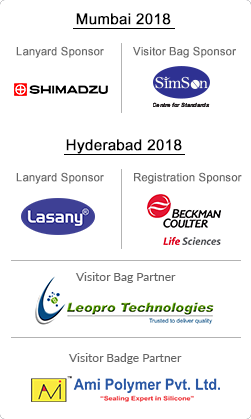 analytica Anacon India and India Lab Expo 2016, the annual trade fairs for analysis, laboratory and biotechnology return to the city of Hyderabad. Accompanying the trade fair, the analytica Anacon India conference is held from October 20 to 21, 2016 at the Hitex Exhibition Center. This year’s conference focusses on Analytical Instrumentation, Emerging Trends in Application, Techniques and Regulatory Compliance. ‘Regulatory aspects of Pharmaceutical Laboratories’, ‘Biopharmaceuticals and Bioanalysis’, ‘Food Safety’ or ‘Clinical Diagnosis’ are the main topics of the 2016 edition of the analytica Anacon India conference. The speakers, eminent scientists and industry representatives, come from both—India and overseas. The program is rounded out by tutorials in all four sessions where practical application tips are passed on the audience. Among this year’s speakers are (in alphabetical order): Dr. Laxmikant Gandikota (Biological Evans), Dr. Ashes Ganguly (Indian Analytical Instruments Association), Prof. Dr. Myeong Hee Moon (Yonsei University), Prof. Dr. Michael Hilderbrand (University of Jena), Prof. Dr. Dietmar Knopp (Technical University of Munich), Prof. Dr. Rainer Lehmann (University of Tuebingen), Dr. Eike Reich (CAMAG), Dr. Pia Rosendahl (ISAS), Prof. Dr. Michael Rychlik (Technical University of Munich), Prof. Oliver Schmitz (University of Duisburg-Essen), Arjan Timmerman (Waters Corporation) and Dr. S. P. Vasireddi (Vimta Labs). The organizers expect more than 350 exhibitors and 8,500 visitors to analytica Anacon India and India Lab Expo. Both trade fairs have been growing in stature as one of the most influential pit-stops in the Indian Annual Trade Fair calendar. The two events bring together companies with similar product lines and business interests, apart from bringing the buyer and seller community on one common platform. The conference and various further forums will transmit additional momentum and background information on the various topics being deliberated at the trade fairs.